Six more feature-length episodes of the acclaimed Swedish crime drama based on the novels by Henning Mankell. 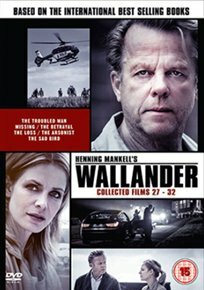 Krister Henriksson stars as Kurt Wallander, a jaded police detective ground down over the years by difficult events in his personal life. As he investigates a string of grisly crimes in the cheerless town of Ystad, Wallander is accompanied in his work by his troubled daughter Linda (Johanna Sallstrom). Episodes are: ‘The Troubled Man’, ‘Missing’, ‘The Betrayal’, ‘The Loss’, ‘The Arsonist’ and ‘The Sad Bird’.